Nursing Procedure Measuring Blood Pressure. Blood pressure (BP) is a measurement of the pressure within the vascular system as the heart contracts (systole) and relaxes (diastole). 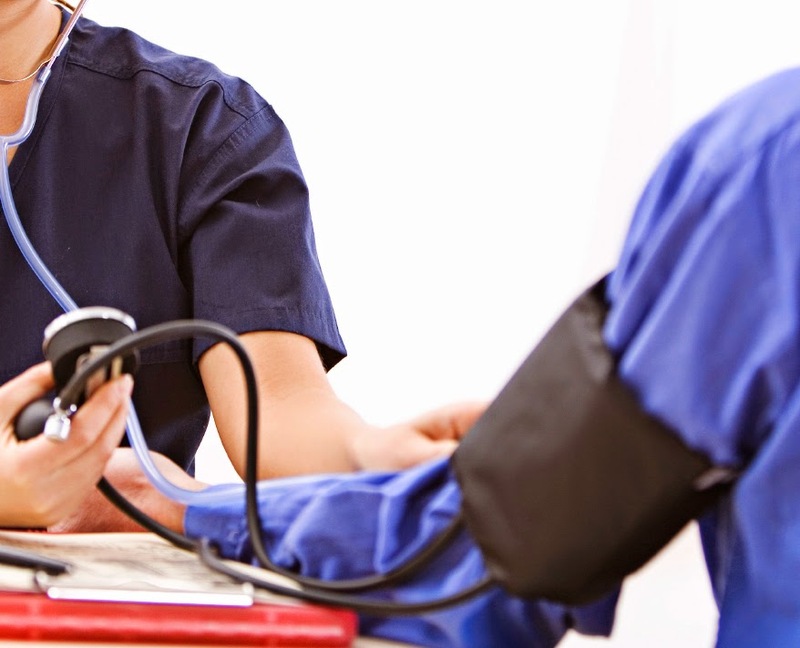 BP indirectly reflects your patient’s overall cardiovascular functioning. It is equal to CO time’s peripheral vascular resistance (BP CO PVR). Normal BP varies with age. Other factors that can affect BP include stress, genetics, medications, heavy meals, diurnal variations, exercise, and weight. Normal BP for an adult ranges from 100 to less than 120 mmHg (systolic) and from 60 to less than 80 mm Hg (diastolic). Normal BP for children and infants are much lower. A systolic reading 120 to 139 mmHg and a diastolic reading 80 to 89 mmHg is considered prehypertension; a systolic 140 to 159 mm Hg with a diastolic 90 to 99 mmHg, stage 1 hypertension; a systolic 160 mm Hg or higher with a diastolic 100 mm Hg or higher, stage 2 hypertension; and a systolic reading lower than 90 mm Hg and a diastolic reading lower than 60 mm Hg is considered hypotensive. Do not take a blood pressure (BP) on an injured or painful extremity or one where there is an intravenous line (IV). Cuff inflation can temporarily interrupt blood flow and compromise circulation in an extremity already impaired or a vein receiving IV fluids. Bladder width should equal 40% and length should be at least 60% of the circumference of the extremity. Auscultatory pressure is the traditional method using a sphygmomanometer cuff. It correlates poorly with directly measured values at the extremes of pressure. Palpatory systolic pressure is defined as the pressure when a pulse is detected in the radial artery as the cuff is deflated. Automated indirect devices measure without manual inflation and deflation. Oscillometric methods correlate well with group average values, but they correlate poorly with intra-arterial pressures in individual patients. Doppler sensing devices are slightly better but still vary quite a bit. Volume clamp devices respond rapidly to changes in blood pressure and may be appropriate for use in critical care in the future. Automated noninvasive monitors have a role in following trends of pressure change but are of little value in situations in which blood pressure fluctuates rapidly. Critical management decisions should not be made based on their results unless use of a direct method is impossible. Require invasive procedure with complications including arterial injury, ischemia, thrombus formation, infection, and blood loss, among others. Check record for baseline and factors (age, illness, medications, etc.) influencing vital signs. Provides parameters and helps in device and site selection. Gather equipment, including paper and pen, for recording vital signs. Promotes organization and efficiency. Wash hands. Reduces transmission of microorganisms. Prepare child and family in a quiet and nonthreatening manner. Enhances cooperation and participation; reduces anxiety and fear, which can affect readings. General Guidelines for Measuring Blood Pressure 1- 4. Determine which extremity is most appropriate for reading. Do not take a pressure reading on an injured or painful extremity or one in which an intravenous line is running. Remove clothing as necessary to expose extremity. Move clothing away from upper aspect of arm. Position arm at heart level, extend elbow with palm turned upward. Make sure bladder cuff is fully deflated and pump valve moves freely. Locate the artery by palpation. Allows for proper placement of stethoscope to hear BP. Locate brachial artery in the antecubital space. Apply cuff snugly and smoothly over upper arm, 2.5 cm (1 inch) above antecubital space with center of cuff over brachial artery. Connect bladder tubing to manometer tubing. If using a portable mercury-filled manometer, position vertically at eye level. Palpate brachial artery, turn valve clockwise to close and compress bulb to inflate cuff to 30 mm Hg above point where palpated pulse disappears, then slowly release valve (deflating cuff ), noting reading when pulse is felt again. Insert earpieces of stethoscope into ears with a forward tilt, ensuring diaphragm hangs freely. Relocate brachial pulse with your nondominant hand and place bell or diaphragm chestpiece directly over pulse. Chestpiece should be in direct contact with skin and not touch cuff. Place stethoscope gently over artery. Too firm a pressure will occlude blood vessel. With dominant hand, turn valve clockwise to close. Compress pump to inflate cuff until manometer registers 30 mm Hg above diminished pulse point identified. Slowly turn valve counterclockwise so that mercury falls at a rate of 2–3 mm Hg per second. Listen for five phases of Korotkoff sounds while noting manometer reading. (A faint, clear tapping sound appears and increases in intensity. Swishing sound. Intense sound. Abrupt, distinctive muffled sounds. Sound disappears). Obtain a blood pressure reading. Systolic pressure: The pressure at which you first hear sounds. . Diastolic pressure: The American Heart Association recommends the onset of muffling as the diastolic pressure in children up to 13 years of age; the pressure when sounds become inaudible is the diastolic pressure in children > 13 years of age. Deflate cuff rapidly and completely. Remove cuff or wait 2 minutes before taking a second reading. If appropriate, lower bed, raise side rails, place call light in easy reach. Put all equipment in proper place. Palpate brachial or radial artery with fingertips of one hand. Inflate cuff to 30 mm Hg above point at which pulse disappears. Palpation: Continue to slowly release pressure until a pulse is felt. This is the systolic pressure. The diastolic pressure is recorded as P, e.g., 100/P. The systolic pressure obtained by palpation is 5–10 mm Hg lower than that obtained by auscultation. Deflate cuff slowly as you note on the manometer when the pulse is again palpable.